Integrin-mediated cell adhesion is involved in many essential normal cellular and pathological functions including cell survival, growth, differentiation, migration, inflammatory responses, platelet aggregation, tissue repair and tumor invasion. 24 different heterodimerized transmembrane integrin receptors are combined from 18 different α and 8 different β subunits. Each integrin subunit contains a large extracellular domain, a single transmembrane domain and a usually short cytoplasmic domain. Integrins bind extracellular matrix (ECM) proteins through their large extracellular domain, and engage the cytoskeleton via their short cytoplasmic tails. These integrin-mediated linkages on either side of the plasma membrane are dynamically linked. Thus, integrins communicate over the plasma membrane in both directions, i.e., outside-in and inside-out signaling. In outside-in signaling through integrins, conformational changes of integrin induced by ligand binding on the extracellular domain altered the cytoplasmic domain structures to elicit various intracellular signaling pathways. Inside-out signaling originates from non-integrin cell surface receptors or cytoplasmic molecules and it activates signaling pathways inside the cells, ultimately resulting in the activation/deactivation of integrins. Integrins are one of key family proteins for cell adhesion regulation through binding to a large number of ECM molecules and cell membrane proteins. Lack of expression of integrins may result in a wide variety of effects ranging from blockage in pre-implantation to embryonic or perinatal lethality and developmental defects. Based on both the key role they played in angiogenesis, leukocytes function and tumor development and easy accessibility as cell surface receptors interacting with extracellular ligands, the integrin superfamily represents the best opportunity of targeting both antibodies and small-molecule antagonists for both therapeutic and diagnostic utility in various key diseases so far. Keywords: Integrin, inside-out signaling, outside-in signaling, cell adhesion molecule, angiogenesis. Adhesion of cells to the surrounding extracellular matrix (ECM) and to other cells is essential for tissue integrity, which have been crucial for the evolution from protozoans to metazoans. Integrin-mediated cell adhesion to ECM plays a central role in the formation and remodeling of tissues and organs in multicellular organisms [1-2]. Integrins mediate cell-to-cell and cell-to-ECM adhesion, providing adhesion for stationary cells, traction during cell movement and, importantly, the promotion of many signaling pathways that regulate diverse processes including proliferation, migration, cell survival, differentiation, tumor invasion and metastasis [3-4]. As a family of heterodimeric transmembrane receptors consisting of an α and a β subunit, 18 different α and 8 different β subunits are known in mammals, which can combine to 24 different integrin receptors [5-6]. Some subunits can combine with several different partners, adding to the structural complexity of integrin receptors. All these integrins can be segregated into two groups, one containing and the other lacking an extra von Willebrand factor type A domain (vWFA, known as αA or αI in integrins) in their α-subunits (Fig. 1). The composition and morphology of integrin-dependent adhesions (focal complexes/ podosomes, focal adhesions and fibrillar adhesions) vary with the cell type, matrix and integrin, and may switch from one adhesion contact to another, contributing to cell advancement, tissue remodeling and repair . Based on their important biological and pathological function, integrins have been intensively investigated as imaging or therapy targets, which will be discussed in details in the following chapters of this book. The purpose of this chapter is to give an overall description of the structure, expression pattern, and biological/pathological function of various integrins. The integrin superfamily. The integrins can be subdivided according to their β chains but note that some α chains can combine with several β chains. 24 different integrins are present in humans . Each integrin subunit contains a large extracellular domain (N-terminus of >700 residues), a single transmembrane domain (>20 residues) and a usually short cytoplasmic domain (C-terminus of 13-70 residues) . The I (inserted) domain is the most important integrin domain in ligand recognition . For integrins, the αI domain presents in approximately half of all α subunits and the βI domain presents in all β subunits. The αI domain is the primary ligand binding region in the integrins which have this domain. Whereas in integrins which lack the α I domain, the binding site in the integrin “head” is formed by structural contributions of both the α and β chains . αI is a GTPase-like domain in which the catalytic site at the apex is replaced with a conserved metal-ion-dependent adhesion site (MIDAS), which is occupied by a divalent cation. All of the integrin-ligand interfaces analyzed thus far have had at their center a coordinate bond between the integrin MIDAS and a carboxylate from the ligand and Mg2+ is the physiological metal that comprises integrin MIDAS . αI domains have been crystallized in three distinct conformations, termed closed, intermediate, and open, with coordination of the metal in the MIDAS, arrangement of the β6-α7 loop, and axial disposition of the C-terminal α7-helix along the side of the I domain [13-14]. Change in coordination at the MIDAS of α I domains is coupled to backbone movements of loops that bear the coordinating residues to increase complementarities to ligands (Figure 2) . In the α2 I domain-collagen triple helical peptide structure , the stiff collagen rod docks onto a shallow trench on top of the I domain, with MIDAS situated at the center, coordinated by a glutamate residue of collagen. Another major αI ligand class is comprised of cell surface molecule intercellular cell adhesion molecules (ICAMs). These are recognized by a β2 class of integrins that are exclusively expressed on leukocytes. This interaction is crucial in enabling leukocyte migration into sites of inflammation. Based on the structure of the ICAM-3-αL I domain solved by Song et al. , and the important structural determinants for the interaction are distributed across a rigid scaffold composed of a β sheet and a structurally constrained loop. When present, αI domain is situated at the top of the heterodimer and forms clear protrusions [18-19], whereas the βI domain folds together intimately with the β-propeller domain of the a subunit, constituting half of the large globular head . The crystal structure of the ectodomain from the αI domain-lacking integrin, αvβ3, was also determined in both unliganded (in the presence of Ca2+ or Mn2+) and ligand-bound states [11, 21]. 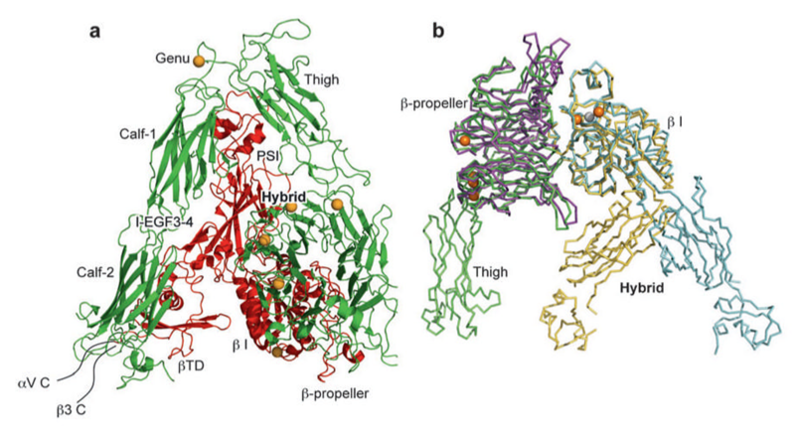 As shown in Figure 3, αv consists of four domains: an N terminal seven-bladed β-propeller, an Ig-like Thigh domain and two large β-sandwich domains, Calf-1 and Calf-2. The β-subunit comprises an N-terminal cysteine-rich PSI (Plexin-Semaphorin-Integrin) domain in which an Ig-like “Hybrid” domain is inserted in its c-terminal loop (the Hybrid domain contains in turn an αA-like domain (βA domain) inserted between its two β-sheets). PSI is followed by four EGF-like domains and a membrane proximal novel tail domain (β-TD). The propeller and βA domains assemble into a “head” structure, which accounts for formation of the αβ heterodimer. The integrin head sits on top of an α and a β “legs”, formed respectively of the Thigh and Calf domains from the αV-subunit and the PSI, Hybrid, EGF1-4 and βTD domains from the β3-subunit . The structure of liganded αvβ3 ectodomain was determined after diffusing the high affinity cyclic pentapeptide, cilengitide, which contains the prototypical Arg-Gly-Asp (cRGD), into preformed integrin crystals in the presence of 5 mM Mn2+. RGD inserts into a crevice between the propeller and βA domains, with the residues R and D side chains exclusively contacting the propeller and βA domains, respectively, and bringing these two domains closer together . The activating inward movement of α1 helix and rearrangement of the F/α7 loop seen in liganded α I are also observed in liganded β I, leading to similar although much less dramatic changes in the three surface loops coordinating MIDAS and the SDL loop. Metal coordination at ADMIDAS changes significantly, such that it no longer locks the α1 helix to the F/α7 loop, allowing the activating movements in both. The inward movement of α1 carries ADMIDAS with it, moving it closer to MIDAS, thus helping stabilize the new metal ion at MIDAS . Conformational change and transmission of allostery by α and β I domains. (a) The α I domain. Nonmoving segments of the backbone are shown as a gray worm. The moving segments of the backbone and the MIDAS metal ions are closed (gold) and open (cyan). The direction of movement is indicated with arrows. (b) The β I domain and its linkage to the hybrid and plexin/semaphorin/integrin (PSI) domain. Nonmoving segments of the β I backbone are shown as a gray worm. Moving segments and metal ions are color coded as shown. Directions of α1- and α7-helix movements are shown with arrows . Crystal structures of integrins αVβ3 and αIIbβ3. (a) The structure of αVβ3 in the bent conformation. The αV and β3 subunits are colored in green and red, respectively. (b) Superposition of liganded-open αIIbβ3 and unliganded-closed αVβ3 headpieces. The α and β subunits are colored in green and yellow in αVβ3 and in purple and light blue in αIIbβ3. Calcium and magnesium ions in αIIbβ3 only are gold and gray spheres, respectively . Crystal structures of the αvβ3 ectodomain in complex with the cyclic RGD peptide , as well as another RGD-type integrin (αIIbβ3) complexed with ligand mimetic compounds  have revealed that the minimal RGD set provides two essential anchorpoints: one is the Asp carboxylate, which coordinates directly the β MIDAS; the other is the Arg side chain (or basic moiety), which forms a salt bridge to an acidic residue in the b-propeller domain of the αv/αIIb subunit. In addition, these anchorpoints are located at the bottom of the narrow cleft or 'well', where the small ligand compounds are well accommodated, burying more than half of the molecular surface at the interface. αvβ3 integrin shows little preference in its choice among the many RGD-containing proteins. Surprisingly, even the strict RGD sequence requirement rule can be bent . For example, cells from homozygous knock-in mice carrying the RGD→RGE mutation in fibronectin exhibited normal fibronectin assembly in an αvβ3-dependent manner . This observation indicated that the positioning of both an acidic and basic residue in proper geometrical proximity is sufficient for meaningful affinity. The well-type pocket containing β MIDAS seems specifically designed to accommodate 'loop ligand'. Residues adjacent to RGD seem to provide some specificity toward certain integrins, both by making extra direct contacts and by changing the 'width' of the RGD segment [25-26]. Although α MIDAS and β MIDAS normally function in a tandem fashion in αI domain-containing integrins, they each could potentially engage two independent external ligands simultaneously. For example, semaphorin 7A, a GPI-anchored membrane protein that contains an RGD motif, was reported to promote axon outgrowth through b1 integrin(s), though the α subunit responsible for this activity was not determined . Purified a1b1 does recognize semaphorin 7A in an RGD-dependent manner . It is therefore tempting to speculate that RGD binds to the β MIDAS, leaving the α MIDAS unoccupied. Laminins are major basement membrane proteins composed of three different polypeptide chains, termed a, b, and g. Till date, five a, three b, and three g chains are known to make up at least 15 isoforms of heterotrimeric laminins in mammals . It has been reported that integrins exhibited a distinct laminin isoform preference . Mutational and antibody mapping studies have revealed that C-terminal laminin globular (LG) domains of the a chain, particularly LG1-3, are important for integrin recognition . However, recombinant fragments corresponding to this region have not shown significant cell adhesion activity comparable to that of intact heterotrimeric laminins. Full integrin-binding activity of LG1-3 requires the heterotrimeric C-terminal portion of the coiled-coil domain, including the most distant C-terminal region of the b and g chains . Accumulating evidence supported that the structure changes of integrins are the basis of the integrin signaling. Indeed, negative stain electron microscopy with image averaging of integrins has shown three overall conformations of the extracellular domain and these correspond to a low affinity, bent conformation (as in the αvβ3 structure), an intermediate affinity, extended form with a closed headpiece, and a high affinity, extended form with an open headpiece, which is induced by ligand mimetic compounds . In integrins that lack the I-domain, the ligand binds directly to the β I-like domain, and causes a downward movement of its α7 helix, similarly to what was described above for the integrin α I-domains. This shift results in a swing-out movement of the β chain hybrid and PSI domains and these domains act as a rigid lever that transmits and amplifies the motion, resulting in a separation of the α and β legs and integrin extension . On the other hand, the swing-out movement of the upper β leg could readily occur if it were preceded by extension of both legs. Several models have been proposed to integrate the structural changes of integrins and consequent biochemical findings . For example, a “switchblade” model proposed that the head structure with the large (~ 80°) Hybrid swing-out represents the high affinity state of βA. To provide the necessary space for the Hybrid swing-out, the model suggests that the integrin first fully extend its knees, converting the bent into a linear asymmetric conformation, described as such in 2D EM images . An alternate “deadbolt” model suggest that elastic deformation of the F/α7 loop is possible with only modest quaternary changes at the βTD interface with βA and possibly Hybrid domains . It has been found that upon binding of ICAM-5 to the LFA-1 I-domain, a remarkable outward movement of the α7 helix was observed, which resulted in the replacement of the corresponding α7 helix from a neighboring I-domain into the α7 helix position, but in an upside-down configuration. This α7 helix replacement was further propagated, resulting in a large I-domain/ICAM-5 cluster. In this way, a weak initial interaction between the integrin and a ligand can result in the formation of large ligand/receptor aggregates . Integrins bind ECM proteins through their large extracellular domain, and engage the cytoskeleton via their short cytoplasmic tails. These integrin-mediated linkages on either side of the plasma membrane are dynamically linked. The cytoskeleton controls affinity and avidity of the integrin extracellular domain to modulate the ECM, and integrin binding to ECM changes the shape and composition of the cytoskeleton beneath . Thus, integrins communicate over the plasma membrane in both directions, i.e., outside-in and inside-out signaling . In outside-in signaling through integrins, ligands bind to extracellular integrin domains, where a conformational change occurs so that the signal is transmitted into the cell. Integrin clustering may also occur. Inside-out signaling originates from non-integrin cell surface receptors or cytoplasmic molecules and it activates signaling pathways inside the cells, ultimately resulting in the activation/deactivation of integrins. In this case, adhesion may be regulated both by conformational changes in the integrin and by valency change (integrin clustering). In fact, both signaling events may occur simultaneously and reinforce each other . 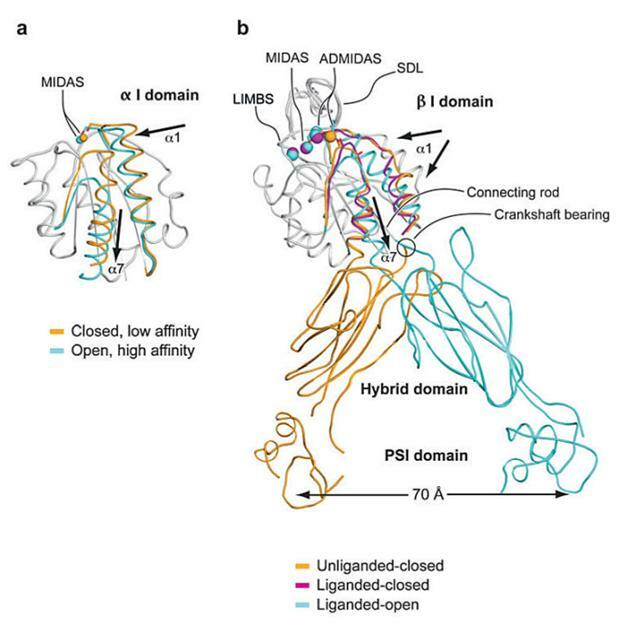 Changes in interactions and/or in the structures of the cytoplasmic domains of integrins within the membrane-proximal regions play crucial roles in integrin activation via inside-out signaling [37-38]. Conformational changes of integrin induced by ligand binding on the extracellular domain altered the cytoplasmic domain structures to elicit various intracellular signaling pathways. A prominent biochemical event in integrin outside-in signaling is protein tyrosine phosphorylation due to activation of Src and FAK family protein tyrosine kinases [39-40]. Src and its inhibitory Csk are constitutively bound to the integrin β-tails. Integrin binding to ligand induces Src activation through Csk dissociation, Src transphosphorylation and/or recruitment of tyrosine phosphatases (e.g receptor tyrosine phosphatase RPTPα, or PTP-1B . However, the spatiotemporal and structural basis of the interaction of integrin cytoplasmic-tails with the growing list of signaling molecules including cytosolic and receptor kinases (Src, FAK, Syk, ILK and PKC) and phosphatases remains to be determined . The integrin cytoplasmic domains play a central role in integrin activation [41-42]. However, the short integrin cytoplasmic tails lack enzymatic activity, and so depend on recruitment of adaptor molecules and signaling proteins for effector functions . Talin is a major cytoskeletal protein that co-localizes with and binds to integrins and to actin and actin-binding proteins such as vinculin . It has been demonstrated that binding of talin to the β cytoplasmic domain is a crucial, final step in activation of several classes of integrins [44-45]. Knockdown of talin expression in CHO (Chinese-hamster ovary) cells inhibits the activation of both β1 and β3 integrins without altering integrin expression . NMR studies suggest that direct disruption of α-β tail interaction by the talin head domain result in integrin activation . Proposed a two-step activation model, the talin head domain first recognizes the high-affinity binding site in the membrane-distal region, which provides a strong linkage between the talin and the integrin β tail, and subsequently binds to a second lower-affinity membrane proximal site that is involved in α-β association, triggering separation of the tails and integrin activation [47-48]. Although talin is an important player in integrin activation mechanisms, the possibility remains that other integrin tail-binding proteins can substitute for talin. For example, many other PTB-domain-containing proteins including Numb, Dok-1, ICAP-lα (integrin cytoplasmic domainassociated protein-lα) and Kindlins bind to integrin β tails in a similar fashion to talin . Integrin activation requires transmission of conformational rearrangements from the cytoplasmic face to the extracellular domain. The interaction between the membrane-proximal regions of the α and β subunits is believed to be stabilized by a salt bridge between a conserved arginine residue in the α tail and an aspartate residue in the β tail and by the hydrophobic residues immediately N-terminal to the arginine and aspartate residues . Mutations that disrupt this 'clasp' lead to integrin activation, and integrins can be constitutively activated by deletion or mutations in these membrane-proximal sequences . These data together strongly indicate that this membrane-proximal interaction plays an essential role as a stabilizer in the association of the α and β membrane proximal regions, maintaining the integrins in a low-affinity state. In addition, mutational analysis and computational modeling together suggest that a helical interface between the integrin α and β subunit transmembrane domains stabilizes the inactive state, and suggest that disruption of this helical transmembrane interface leads to activation  . The majority of integrin ligands are protein components of ECM (Table 1). ECM is assembled from components synthesized and deposited outside the cell surface that provide structural and functional integrity to connective tissues and organs . The ECM can also serve as a reservoir or provisional matrix for growth factors and plasma proteins found in the blood . The protein components of ECM can be divided into three major classes: (1) structural proteins such as the collagens and elastin (although collagen can also have functional properties); (2) multidomain adhesive glycoproteins such as fibronectin, vitronectin, and laminin; and (3) matricellular proteins such as secreted protein acidic and rich in cysteine (SPARC; also known as osteonectin and BM-40), thrombospondin 1 (TSP1) and 2 (TSP2), tenascin C and X, and osteopontin . Among them, collagen primarily provides tensile strength to the tissue and elastin is responsible for the elastic recoil. Fibronectin, an adhesive glycoprotein, is a multifunctional protein that can act as a structural molecule owing to its fibrillar architecture, a biological glue that mediates interactions between cells and other ECM proteins, or a bridge forming cell to cell contacts . Matricellular proteins are secreted macromolecules that interact with cell-surface receptors, ECM, growth factors, and proteases but do not function as structural molecules per se . These glycoproteins regulate interactions between cells and ECM. For instance, SPARC, TSP1, and tenascin C disrupt cell-matrix interactions (i.e., are counteradhesive) — a critical component of angiogenesis and tissue remodeling . All five αV integrins, two β1 integrins (α5, α8) and αIIbβ3 share the ability to recognize ligands containing an RGD tripeptide active site, which is shared by The RGD binding integrins are among the most promiscuous in the family, with β3 integrins in particular binding to a large number of ECM and soluble vascular ligands including fibronectin, fibrinogen, vitronectin, vWF, LAP-TGFβ and Del-1. Although many ligands are shared by this subset of integrins, the rank order of ligand affinity varies, presumably reflecting the preciseness of the fit of the ligand RGD conformation with the specific α-β active site pockets . Collagens are a major family of structural ECM proteins and characterized by the presence of triple helical regions. Cells employ four different αI domain containing integrins including α1, α2, α10, and α11 to maintain holds with them. Immunoglobulin superfamily members also act as ligands for several integrins, and the best characterized integrin ligands are VCAM-1 (Vascular Cell Adhesion Molecule) and the ICAMs. VCAM-1 binds to α4β1, αVβ3 and α4β7, whereas the leukocyte-specific CD11/CD18 integrins (including LFA-1 and Mac-1) bind to ICAMs . Cell adhesion is involved in many essential normal cellular and pathological functions including cell survival, growth, differentiation, migration, inflammatory responses, platelet aggregation, tissue repair and tumor invasion. Integrins are one of key family proteins for cell adhesion regulation through binding to a large number of extracellular matrix molecules and cell membrane proteins. Using knockout mice it has become evident that the integrins possess both redundant and nonredundant functions, and that lack of expression may result in a wide variety of effects ranging from blockage in pre-implantation to embryonic orperinatal lethality and developmental defects. β1 Integrin. The largest subgroup of integrins is formed by the β1 subunit containing integrins which consist of 12 members with different ligand binding properties. Besides ECM proteins, some β1 integrin containing receptors also interact with cellular receptors. For example, α4β1 and α9β1 bind to VCAM-1 and α4β1 to MadCAM-1 . During early embryogenesis totipotent embryonic cells differentiate and polarize to form endoderm, basement membrane (BM), and ectoderm. However, embryoid bodies derived from β1-deficient ES cells develop endoderm, but do not form a BM, polarized ectoderm and a cavity . β1-integrin null embryos die by embyronic day (E)9.5-10.5 in utero owing to implantation defects [62-63]. The major function of β1 integrin during early development may be to induce laminin-1 expression since exogenous addition of laminin 1 allows BM formation also in the absence of β1 integrins, though the signaling pathway mediating the regulation is still unclear . β1 integrins are crucial for the attachment of basal keratinocytes to the BM, since loss of β1 leads to widespread blisters between the epidermis and the BM. In addition, loss of β1 integrin in skin decreases the proliferation of basal keratinocytes by about 70% . Similarly to skin, β1 integrins are important for the attachment to and maintenance of the BM in brain . Although β1 integrins are important ECM receptors, they are not generally required for cell migration. While some cells, such as keratinoctes or primordial germ cells, are highly dependent on β1 integrin, other such as myoblasts, neurons and lymphocytes migrate normally also in the absence of β1 integrin. Tumor cells expressing β1 integrin formed significantly larger primary tumors and had a dramatically increased metastasis into liver and lung . Moreover, ablation of the β1 integrin gene in mammary epithelium dramatically impairs mammary tumorigenesis in mice . However, in human patients, no clear correlation between tumor formation, invasion and β1 integrin expression could be identified yet. Integrins α1β1 and α2β1 are expressed on lymphatic endothelium in healing wounds in response to VEGF. Inhibition of these integrins blocked lymphangiogenesis in these wounds . In normal animals, VEGFA treatment upregulates expression of both α1β1 and α2β1 on vascular endothelial cells. Function-blocking antibodies directed against both integrins reduced VEGFA-induced angiogenesis in vivo and reduced tumor growth and angiogenesis . Tumors grown in α1β1-deficient mice grew more slowly and exhibited less angiogenesis, indicating an important role for this integrin in angiogenesis . However, mice lacking α2β1 integrins exhibit increased B16F10 melanoma growth and angiogenesis when compared with wild-type mice . By contrast, Lewis lung carcinoma (LLC) tumors did not exhibit increased angiogenesis or growth in α2-null mice. The different response resulted from different level of a VEGFR1 binding placental growth factor (PLGF) expression which was high from B16F10 melanoma cells and low from LLC cells. Enhanced angiogenesis was attributed to an increase in VEGFR1 expression and function on α2-null endothelial cells . Integrin α4β1, a receptor for VCAM and fibronectin containing the CS1 region, is best known as a lymphocyte integrin involved in adhesion and extravasation of lymphocytes by binding to VCAM1 which is expressed on inflamed endothelial cells. Loss of integrin α4 during development leads to defects in placentation, heart development and coronary artery development, causing lethality between E10.0 and E12.0 . It has been reported that integrin α4β1 was expressed on neo-vasculatures in both murine and human tumors and responded to VEGF, bFGF, IL1 and TNF. Antagonists of α4β1 blocked tumor neovascularization by induction of cell death of both endothelial cells and pericytes and decreased tumor growth in chick and murine models of tumor growth . It has been proposed that integrin α4β1-VCAM1 interactions facilitated close proximity of the endothelial cells and pericytes, which promoted the survival of both endothelial cells and pericytes during angiogenesis . Moreover, integrin α4β1 selectively promotes the homing of both endothelial progenitor cells and monocytes to neovascular tissue . Treatment of mice bearing LLC tumors with antagonists of integrin α4β1 significantly suppressed the number of monocytes and progenitor cells found within tumors and reduced blood vessel density , indicating that the suppression of monocyte and progenitor cell homing to tumors by integrin α4β1 antagonists could be a useful supplementary approach to suppress tumor angiogenesis and growth. Embryonic deletion of the integrin α5 subunit induces early mesenchymal abnormalities, leading to lethality of α5-null embryos . Further studies using α5-null ES cells to grow teratocarcinomas showed decreased proliferation, increased apoptosis and decreased vascularization in teratocarcinomas derived from α5-null ES cells compared with controls . Integrin α5β1 expression is induced in response to a variety of angiogenic stimuli, such as bFGF, IL8 and the ECM protein DEL1 (also known as EDIL3), but not by VEGF . Integrin α5β1-mediated adhesion promotes endothelial cell migration and survival in vivo and in vitro by suppressing the activity of protein kinase A (PKA) . Integrin α5β1 is poorly expressed on quiescent endothelium but its expression is significantly upregulated on endothelium during tumor angiogenesis in both mice and humans . In some types of cancer, integrin α5β1 is also expressed on tumor cells and plays a direct role in tumor cell migration, invasion, and survival [82-84]. A small peptide antagonist (amino-acid sequence PHSCN) to integrin α5β1 significantly reduced neovascularization and formation of metastases in an animal model of prostate carcinoma that expresses integrin α5β1 [83, 85-86]. Expression of α5β1 is also upregulated during corneal angiogenesis . Integrin α6β1 is expressed at high levels in capillary endothelial cells in vivo . Unlike α6β4, which shows a preference for laminin 5, integrin α6β1 binds most laminin isoforms as well as other ECM proteins including CYR61, thrombospondin 1 and thrombospondin 2 . As α6 integrin antagonists and α6 small interfering RNA constructs inhibit angiogenesis, it is possible that integrin α6β1 promotes angiogenesis. However, as these agents can block the function of both integrins α6β1 and α6β4, it is not yet clear what part integrin α6β1 plays in tumor angiogenesis . Antibody inhibitors of α6 integrin prevented endothelial cell tube formation in vitro, suggesting a role for α6 in the angiogenic process . Integrin α9β1 is structurally similar to integrin α4β1. However, unlike α4β1, it is a receptor for a number of ECM proteins and cell surface receptors including tenascin C, thrombospondin, osteopontin, IIICS fibronectin, VCAM1 and other ligands . Integrin α9β1 is expressed on epithelia, osteoclasts, smooth muscle cells and also endothelial cells. α9β1 promotes VEGFA-stimulated angiogenesis by directly binding to VEGFA and blocking antibodies to α9β1 suppress VEGFA-induced angiogenesis . However, other studies found that α9β1 also binds directly to the N terminus of thrombospondin and blocking antibodies to α9β1 inhibited angiogenesis induced by this thrombospondin fragment . Integrin α9β1 also has a role in growth factor-mediated lymphangiogenesis as PROX1, a lymphatic endothelial cell-selective transcription factor, coordinately upregulates integrin α9β1 and VEGFR3 expression and endothelial cell motility in vivo . This integrin promotes VEGFC- and VEGFD-stimulated cell migration by directly binding these growth factors and antagonism of α9β1 suppresses VEGFC-induced motility . Taken together, these studies indicate that α9β1 has unique and crucial roles in lymphangiogenesis. Indeed, integrin α9β1-null mice die 8-12 days after birth owing to lethal defects in development of the lymphatic system; however, they do not exhibit obvious defects in development of blood vessels . αvβ3 Integrin. The integrin αvβ3 is the first of the αv integrins to be characterized and shown to regulate angiogenesis [96-97]. It binds with multiple components of the ECM including vitronectin, fibronectin, fibrinogen and osteopontin since they are all RGD-containing proteins. It has been found in 1994 that integrin αvβ3 was widely expressed on blood vessels in human tumor biopsy samples but not on vessels in normal human tissues. Its expression on endothelial cells is stimulated by angiogenic growth factors such as bFGF, TNFα and IL8 and it is upregulated on endothelium in tumors, wounds and sites of inflammation αvβ3 integrin has a key role in endothelial cell survival and migration during angiogenesis  . Antagonists of αvβ3 inhibited angiogenesis and tumor growth in a variety of animal models of cancer and blocked corneal as well as choroidal angiogenesis in animal models of ocular disease [98-99]. In addition, integrin αvβ3 antagonists induce endothelial cell apoptosis through a caspase 8-dependent cell death program . In vitro studies revealed that agonists of endothelial cell αvβ3, but not other integrins, suppressed p53 activity, blocked p21WAF1/CIP1 expression, and increased the bcl-2/bax ratio, thereby promoting cell survival . Ligation of endothelial αvβ3 integrin has also been shown to activate mitogen-activated protein kinase (MAPK), FAK and Src, among other kinases, resulting in cell proliferation, differentiation and migration . Based on the sizable body of evidence addressed above, it is reasonable to draw the conclusion that integrin αvβ3 promotes angiogenesis and endothelial cell survival and that antagonism of this integrin suppresses angiogenesis by inducing endothelial cell apoptosis in vitro and in vivo. Indeed, antagonists of β3 integrin are being used in clinical trials as anti-angiogenic therapy, including the humanized monoclonal antibody Vitaxin and the RGD mimetic Cilengitide [103-104]. However, these agents did not appear to be as successful at inhibiting angiogenesis in clinical trials for cancer treatment as originally hoped . Recently, it has been reported that low concentrations of RGD-mimetic integrin inhibitors promote VEGF mediated angiogenesis by altering αvβ3 integrin and vascular endothelial growth factor receptor-2 trafficking, thereby stimulating tumor growth and angiogenesis . More importantly, a series of genetically Knock-out studies forced researchers to reconsider the role of integrin αvβ3 and αvβ5 in angiogenesis. For example, genetic ablation of the αv integrin subunit did not appear to affect developmental angiogenesis . Even conditional deletion of αv integrin in Tie2-expressing endothelial cells is not sufficient to affect angiogenesis either . Furthermore, β3 null and β3/β5 doubly deficient mice produce vascular networks without obvious defects during developmental angiogenesis, and more surprisingly, display enhanced tumor growth and pathological angiogenesis [109-110]. However, male mice lacking β3 integrin exhibit coronary capillaries of irregular endothelial thickness, with endothelial protrusions into the lumen, and expanded cytoplasmic vacuoles. These defective coronary vessels can be normalized by administration of inhibitors of VEGF or VEGF receptor 2 (VEGFR2, also known as KDR), suggesting that enhanced VEGF signaling might compensate for the loss of β3 integrin . In addition, with a mouse knockin model, it has been demonstrated that the phosphorylation of Tyr747 and Tyr459 in β3 integrin participates in enhancing pathological angiogenesis . All considered, the above studies suggest that avβ3 integrin may have both positive and negative roles during angiogenesis. Indeed, avβ3 can bind a plethora of factors that are thought to enhance angiogenesis including VEGFR2, vitronectin, fibronectin, Del1, ANGPTL3, CYR61, bone sialoprotein, thrombin, and can also bind to several factors that are thought to induce anti-angiogenic effects including thrombosondin, angiostatin, and tumstatin . Another explanation is that functioning as a biosensor, avβ3 may promote angiogenesis in the ligated state, but when ligands are absent or ligand binding is antagonized, avβ3 may activate a death pathway to inhibit angiogenesis. Thus, depending on the microenvironment and the ligation state, integrins promote or inhibit angiogenesis by positively or negatively regulating cell survival . In this way, integrin avβ3 appears to function as a regulator of angiogenesis by balancing opposing signals in the tumor microenvironment. αvβ5 integrin. All though integrin αvβ5 binds with similar ECM components with αvβ3, the related angiogenic promoting pathway is distinct from that regulated by αvβ3. For example, anti-αvβ3 antibodies blocked angiogenesis induced by bFGF, whereas antibodies that target αvβ5 blocked the angiogenesis induced by VEGF in both the rabbit corneal eye pocket and the chick chorioallantoic membrane assay . The VEGF- αvβ5 pathway is dependent on Src kinase and protein kinase C30. In vivo angiogenesis assays showed αvβ5 is required for TGF- β and VEGF-mediated angiogenesis and VEGF acted through αvβ5 to promote vascular permeability , indicating αvβ5 may also promote tumor metastasis . However, integrin αvβ5-null mice exhibit completely normal development and normal angiogenesis , indicating that this integrin is not required for vascular development. Genetic ablations of the αv subunit, which eliminate expression of integrins αvβ1, αvβ3, αvβ5, αvβ6 and αvβ8 suggest that, in some mice, αv integrins are not required for blood vessel development in most tissues. Twenty percent of embryos lacking αv integrins survive to birth with normal blood vessels in many tissues. However, 80% of mice die in utero between E10.5 and E11.5 with defective placental blood vessels. The remaining 20% of αv-null mice die shortly after birth with severe brain and intestinal haemorrhage, with distended and leaky vessels in these tissues . Thus, αv integrins appear to have key roles in embryonic development of blood vessels in tissues such as placenta and brain. αvβ6 integrin. The αvβ6 receptor is the only known integrin that is restricted exclusively to epithelial cells . The αvβ6 integrin is expressed primarily during embryonic development and is not expressed constitutively in healthy epithelia. However, αvβ6 is upregulated during tissue remodeling, including wound healing and carcinogenesis . αvβ6 facilitates keratinocyte adhesion and migration on fibronectin, tenascin and vitronectin, all of which are components of the early wound matrix . Using mouse β6-/- keratinocytes, Huang et al. found that αvβ6 expression promotes keratinocyte migration through a pathway involvling protein kinase C . Binding of αvβ6 to its ligand upregulated secretion of the pro-enzyme form of type IV collagenase, MMP-9, and exogenous activation of MMP-9 further increased keratinocyte migration . Thomas et al. demonstrated that binding of αvβ6 to the TGFb1 latency associated peptide (LAP) promotes cell migration and MMP-9 expression, and also that cells will invade towards soluble LAP in an αvβ6-dependent manner . In addition, TGFb1 induces de novo expression of αvβ6 in normal human keratinocytes  and on the non-transformed keratinocyte cell line, HaCaT . To date, αvβ6 expression has been reported in carcinomas of the lung, breast, pancreas, stomach, colon, ovary, salivary gland as well as oral and skin squamous cell carcinoma [120, 127-131]. Elevated αvβ6 expression facilitated the invasion and dissemination of colon carcinoma cells in vivo [132-133]. The β6 overexpressing cell line was significantly more invasive, which was, in part, through αvβ6-dependent upregulation of the type IV collagenase MMP-9 [134-135]. High αvβ6 expression correlated with elevated uPA, uPAR and MMP-9 in ovarian carcinoma cell lines . It has also been proposed that contribution of αvβ6 for promoting cancer progression in vivo is related to the mechanism of epithelial-mesenchymal transition (EMT) by activating latent TGF-b . The upregulation of αvβ6 related with the poor prognosis , suggesting that αvβ6 expression may be useful in predicting malignant transformation. Indeed, the integrin αvβ6 now emerges as an attractive new candidate as a therapeutic target for metastatic colon carcinoma. However, epithelial cells in samples of lichen planus (a chronic mucocutaneous disease) have also been shown to express αvβ6 suggesting that αvβ6 expression per se is insufficient to drive malignant progression . The net effect on tumor behavior is likely to depend on the stage of tumor development. In the later stages of tumor development, as cells become refractory to growth inhibition, then the role of LAP in promoting both αvβ6-dependent cell movement and MMP-9 expression may become prominent, culminating in a pro-oncogenic effect of TGFb . α6β4 Integrin. α6β4 plays a key role in the formation and stabilization of junctional adhesion complexes called hemidesmosomes (HDs) that are connected to the intermediate filament (IF) system, as well as in the regulation of a variety of signaling processes. Increased expression of α6β4 and changes in its distribution were then correlated with increased aggressiveness of tumors and poor prognosis . β4 subunit has an unusual size of approximately 200 kDa, which is due to an unusually long cytoplasmic domain of over 1,000 amino acids . This domain contains two pairs of type III fibronectin (FNIII) domains, separated by a connecting segment (CS) . β4 knockout mice developed severe blistering of the skin . Moreover, a mutation in the β4 gene is responsible for the pyloric atresia associated with junctional epidermolysis bullosa (EB) syndrome in humans. It has been found that interaction between α6β4 and plectin is critical for proper HD assembly and at least two sites on plectin and three on β4 mediate their interaction. The actin binding domain (ABD) of plectin binds to the first pair of FNIII domains and part of the CS of β4 . Two other HD components, BP180 and BP230, bind to the third FNIII domain of β4 and to a region comprising the C-terminal end of the CS and the second pair of FNIII domains, respectively . The α6 subunit of α6β4 interacts with the tetraspanin CD151 . Apart from promoting keratinocytes migration, studies on the invasion of carcinoma cells revealed a role for α6β4-dependent activation of phosphatidylinositol (PI)-3 kinase, which is an upstream regulator of Rac1 . Since growth factors activate enzymes that initiate the disassembly of HDs, the presence of overactive growth factor receptors may explain why α6β4 is unable to initiate HD formation in many carcinoma cells. In fact, α6β4 cooperates with several different tyrosine kinases in carcinoma cells to promote invasion, including c-met (hepatocyte growth factor receptor), ErbB2 and ErbB1 . There is evidence that proteins other than tyrosine kinases can cooperate with α6β4 to promote invasion. For example, invasion of breast carcinoma cells is stimulated by promoting Rab11-mediated vesicular trafficking under hypoxic conditions . Leukocytes specific integrins. The arrest of leukocytes rolling on target vascular beds involves rapid formation of shear-resistant adhesions by specialized leukocyte integrins. This arrest can be mediated by integrins that contain the β2 subunit, e.g. aLβ2 (leukocyte functionassociated antigen-1 (LFA-1)) or α4 subunit, e.g. α4β1 (very late antigen-4 (VLA-4)). In leukocytes, integrins are involved in slow rolling, adhesion strengthening, and transendothelial migration [150-151]. Lymphocyte and myeloid cells cease rolling and arrest on lymph node high endothelial venules as well as on peripheral tissues upon activation of at least one of the four major leukocyte integrins: VLA-4, α4β7, LFA-1, and the myeloidspecific integrin (integrin αMβ2 (Mac-1)) . In addition, these integrins transmit signals that facilitate respiratory burst, complement-mediated phagocytosis, cytokine production, proliferation, survival, differentiation, degranulation, and cellular polarization. Loss or reduced β2 on cell surface, defects in β2 signaling, mutations in β2 will cause leukocyte adhesion deficiencies (LAD) . 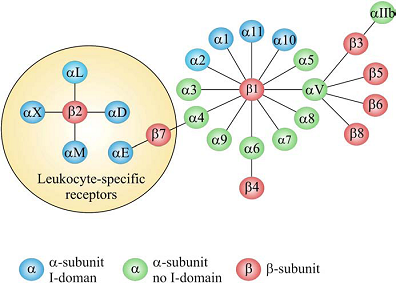 Most circulating leukocytes maintain their integrins in largely low affinity state . Leukocyte integrins must undergo in situ modulation to develop high avidity for their endothelial ligands to establish shear-resistant adhesion and firm leukocyte arrest on the target endothelial site . For most leukocytes, this dramatic change in integrin affinity is triggered when the rolling leukocyte encounters and rapidly responds to a proper chemoattractant signal presented on the apical endothelial surface . The distribution of LFA-1 integrins to the leading edge of a polarized leukocyte is reported to proceed through a signaling cascade involving Rap1 and its downstream effectors RAPL and the threonine-serine kinase, Mst1 . Integrins play key roles in cellular migration acting both as adhesive molecules that maintain locomotion over the apical endothelial surface and as signaling molecules, which, together with chemokine signals, maintain polarity and motility . Leukocyte integrins are recognized therapeutic targets in various diseases, and integrin blocking monoclonal antibodies (natalizumab against α4 integrins and efalizumab against LFA-1) are already used in the clinic against multiple sclerosis and psoriasis [159-160]. Leukocyte adhesion cannot be inhibited by compounds containing the RGD sequence, but longer peptides to recognition sites in ICAM molecules or microbe-derived ICAM-1 inhibitors do show inhibitory activity [161-162]. It has been reported that promatrix metalloproteinases (proMMPs), particularly proMMP-9, are potent ligands of the leukocyte β2 integrins and translocating proMMP-9/ αMβ2 complex is part of the cell surface machinery guiding neutrophil migration , suggesting that a promising therapeutic approach could be to disrupt the association between the matrix metalloproteases and integrins. It has also been found that the Del-1 protein is an important endogenous inhibitor of leukocyte adhesion . The Del-1 protein is a secreted protein expressed by endothelial cells in immunoprivileged tissues, such as the brain, the eye, and the lung. Although a secreted molecule, Del-1 is absent from plasma and is rather localised to endothelial cells and/or the extracellular matrix . In fact, it binds to the β2 integrins (LFA-1, Mac-1) and when coated on plastic, leukocytes adhere to the protein. However, leukocyte binding to ICAM-1 is inhibited when both Del-1 and ICAM-1 are present. Del-1 knockout mice show a strong activation of adhesion and of inflammatory cell recruitment . Integrins are ideal pharmacological targets based on both the key role they played in angiogenesis, leukocytes function and tumor development and easy accessibility as cell surface receptors interacting with extracellular ligands . So far, the integrin superfamily represents the best opportunity of targeting both antibodies and small-molecule antagonists for both therapeutic and diagnostic utility in various key diseases . Preclinical studies and clinical trials showed that quite a few integrin targeting antibodies were effective to block tumor growth and metastasis. 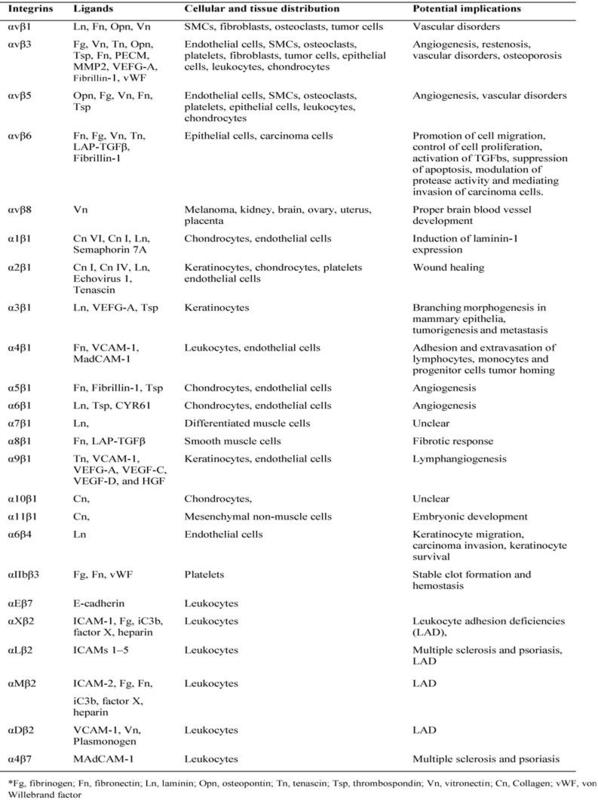 Most of studies focused on αv integrins including MEDI-522 (vitaxin) against αvβ3 , CNTO 95 against both αvβ3 and αvβ5 , 17E6 against αvβ3, αvβ5 and αvβ1 . Besides, antibodies targeting to other integrins have been developed. For example, Tysabri (natalizumab), an antibody which blocks α4 integrins and inhibits the α4-mediated adhesion of leukocytes to their counter receptor was used for treatment of patients with relapsing forms of multiple sclerosis (MS) . Small molecular antagonists, mainly based on RGD containing peptides and RGD peptidomimetic [169-171], also showed potent inhibition of angiogenesis. More detailed information can be found in several recently published review articles [1, 172]. Integrin ligands are also under investigation as tumor endothelium-targeted diagnostic agents and integrin targeting is proving useful in tumor imaging. Both peptide and antibody-based diagnostic agents targeting RGD-binding integrins or αv integrins have been evaluated in animal models of cancer after 18F or 64Cu labeling. Tumor xenografts with positive integrin αvβ3 expression were visualized clearly on PET images [173-175]. Other imaging modalities besides PET have also been investigated for integrin αvβ3 targeted imaging. For example, integrin αv-targeted ultrasound microbubbles preferentially bound neovasculature at the periphery of experimental tumors . The clinical significance of molecular imaging with integrin-targeting agents may be useful for lesion detection and grading. In addition, imaging will help identify appropriate patients for integrins related therapy and monitor the therapeutic responses. More important, integrin-targeting agents might also be useful in selectively delivering chemotherapeutics or gene therapeutic agents to tumors, thus minimizing systemic toxicities. For example, after fused with a RGD targeting moiety, RGD4C-TNF showed improved tumor accumulation and therapy effect in a human breast tumor model . With regard to activity, signaling and regulation of integrins, evidences are accumulating with more crystal structures deciphered and new models established. However, the integrin pathways are still not fully understood due to extreme complexity. Besides their ligands, increasing number of biomolecules has been identified interacting with integrins including VEGF/VEGFR , HER2 , MMPs , uPAR . Moreover, it has been found that ligand-bound integrins also actively suppress the activation of other integrins in the same cell utilizing different signaling pathways. For example, when α2β1 is ligated, both α5β1 and αVβ3 will be suppressed through PKA. When α5β1 is ligated, α2β1 will be suppressed through PKCα . Integrins are also known to have transdominant roles over other integrins and can thus control overall cell behavior . After epithelial integrity is restored in wounds, αvβ6 expression will be strong upregulated. However, mutating the β6 cytoplasmic domain by removing the terminal 11 amino acids prevents this density-dependent upregulation of αvβ6 and replaces it by upregulating αvβ5. This provides evidence that the expression of these integrins is linked and expression may be switched from one to the other . So far, a lot of breakthroughs in integrin research have been made with purified integrins, or I-domains and their ligands. However, it is becoming increasingly apparent that integrin mediated cell adhesion is unusually complex. Thus, it is critical to study the events occurring at the cellular and organism levels in a temporal manner to make more meaningful conclusions. It is very promising for molecular imaging of living cells or animal models to meet the requirement. For example, microscopic imaging with FRET could identify integrin-integrin interaction and integrin-other proteins interaction in living cells  . PET imaging with positron emission radioisotopes labeled integrin-targeting probes could visualize expression and regulation of integrins in animal models in a real-time mode . We believe integrating data from both microscopic and macroscopic methods will quicken our steps on the long scientific journey to decipher the integrins related pathways. This work was supported by the intramural Research Program (IRP) of the National Institute of Biomedical Imaging and Bioengineering (NIBIB), National Institutes of Health (NIH). Dr. G. Niu currently is an Imaging Sciences Training Fellowship jointly supported by the Radiology and Imaging Sciences Department, NIH Clinical Center and the Intramural Research Program, NIBIB, NIH.